Midland Exploration Inc. (TSX-V: MD) is pleased to announce that it has completed a private placement by issuing to the Caisse de dépôt et placement du Québec a total of 1,111,111 units at $0.90 per unit, for gross proceeds of $1,000,000. Each unit consists of one common share and one half warrant of Midland. Each warrant entitles the holder to purchase one common share of Midland at a price of $1.25 until January 18, 2021. The securities issued in the Offering are subject to a four-month hold period expiring on May 19, 2019. The total gross proceeds of the private placements closed in December 2018 and January 2019 is greater than $5,300,000. 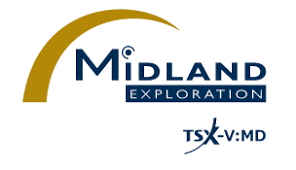 Midland will use the private placement proceeds to fund its exploration plan and for general corporate purposes. As a result of the private placement, there are 65,414,222 common shares of Midland issued and outstanding. The participation of CDPQ Sodémex Inc., which is an insider of Midland, is exempt from the formal valuation and minority shareholder approval requirements provided under Regulation 61-101 respecting Protection of Minority Security Holders in Special Transactions (“Regulation 61-101”) in accordance with sections 5.5(a) and 5.7(1)(a) of Regulation 61-101. The exemption is based on the fact that neither the fair market value of the private placement, nor the consideration paid by such insider exceeds 25% of the market capitalization of the Corporation. The private placement was carried out pursuant to prospectus exemptions of applicable securities laws and is subject to final acceptance by the TSX Venture Exchange. Through its CDPQ Sodémex mining portfolio, la Caisse contributes to the development of Québec’s mining industry by acquiring interests in junior mining companies and mining producers active in Québec. Caisse de dépôt et placement du Québec (CDPQ) is a long-term institutional investor that manages funds primarily for public and parapublic pension and insurance plans. As at June 30, 2018, it held CAD308.3 billion in net assets. As one of Canada’s leading institutional fund managers, CDPQ invests globally in major financial markets, private equity, infrastructure, real estate and private debt. Midland targets the excellent mineral potential of Quebec to make the discovery of new world-class deposits of gold, platinum group elements and base metals. Midland is proud to count on reputable partners such as Agnico Eagle Mines Limited, Osisko Mining Inc., Altius Minerals Corp., SOQUEM INC., NioBay Metals Inc., Nuvavik Mineral Exploration Fund, and Abcourt Mines Inc. Midland prefers to work in partnership and intends to quickly conclude additional agreements in regard to newly acquired properties. Management is currently reviewing other opportunities and projects to build up the Company portfolio and generate shareholder value.